Featuring both a wireless and a dial-up modem, the Global Gateway 9100 is a full-featured, mobile handheld terminal for point-of-sale card transactions. With speedy printing capabilities (eight lines per second) and rapid paper changes, the Global Gateway 9100 supports a wide range of transactions. The Global Gateway 9100 features a high-capacity four-cell battery with a unique cartridge design and a quick release door mechanism for fast and easy battery changes. With both magnetic stripe card and optional smart-card readers, this terminal is ideal for mobile retail merchants who need flexible payment methods to maintain and develop their customer base in todays competitive market. The Global Gateway 9100 supports up to four SAM Smart Card modules, as well as a full-sized customer smart card. It has a secure PIN pad that supports debit card transactions. This small, all-in-one terminal eliminates the need for a separate printer, so its ideal as a desktop point-of-sale unit where space considerations are at a premium. Whether the Global Gateway 9100 accesses the Motient wireless network by using a RIM or Wavenet brand modem or it accesses the AT&T Wireless/Cingular wireless network using the GPRS modem, it is ideal for fulfilling all of your wireless processing needs. 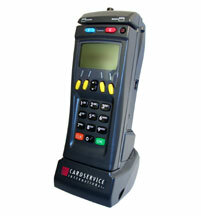 RS-232 interface Able to connect to peripherals, such as bar-code readers, check readers, etc.